The first African American to win the Pulitzer Prize for fiction, Alice Walker was born the eighth child of sharecroppers Willie Lee and Minnie Lou Grant Walker, on February 9, 1944, in Eatonton, Georgia. Walker became the valedictorian of her segregated high school class, despite an accident at age eight that impaired the vision in her left eye. Before transferring to Sarah Lawrence College, where she received a B.A. degree, she attended Atlanta’s Spelman College for two years, where she became a political activist, met Dr. Martin L. King, Jr., and participated in the 1963 March on Washington. Also, during her undergraduate studies, Walker visited Africa as an exchange student. She later registered voters in Georgia and worked with the Head Start program in Mississippi, where she met and married civil rights attorney Melvyn Rosenthal (the marriage lasted ten years), became the mother of daughter Rebecca, and taught at historically black colleges Jackson State College and Tougaloo College. Walker has also taught at Wellesley College, University of Massachusetts at Boston, the University of California at Berkeley, and Brandeis University. At Brandeis she is credited with teaching the first American course on African American women writers. Walker continued working in the civil rights movement while teaching at various universities. During this time she also became a major voice in the emerging feminist movement led by mostly white middle-class women. Aware of the issues of race in that movement, Walker later created a specific black woman centered feminist theory, which she called “womanism,” to identity and assess the oppression based on racism and classism that African American women often experience. Walker’s collected work includes poetry, novels, short fiction, essays, critical essays, and children’s stories. Her collections of poems includes: Once (1968), Revolutionary Petunias And Other Poems (1973), Horses Make A Landscape Look More Beautiful (1984), and Absolute Truth in the Goodness of the Earth: New Poems (2003). Her novels include The Third Life of Grange Copeland (1970), Meridian (1975), The Color Purple (1982), The Temple of My Familiar (1989), Possessing the Secret of Joy (1992), By the Light of My Father’s Smile (1998), and Now Is The Time to Open Your Heart (2005). Her major non-fiction works includes Living by the Word, I Love Myself When I am Laughing . . . And Then Again When I am Looking Mean And Impressive: A Zora Neale Hurston Reader (1979), In Search of Our Mother’s Garden: Womanist Prose (1983) and Warrior Marks: Female Genital Mutilation and the Sexual Blinding of Women (1993). Walker’s most recent work is We Are The Ones We Have Been Waiting For (2007). 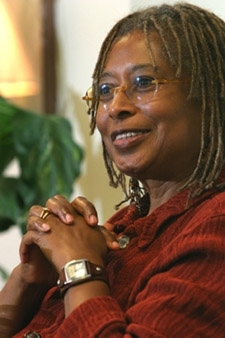 The recipient of a Rosenthal Foundation award and an American Academy and Institute of Arts and Letters award for In Love and Trouble, Walker won the National Book Award and Pulitzer Prize for fiction for The Color Purple, which has been made into a Stephen Spielberg directed movie and Broadway musical produced by Oprah Winfrey. Committed to maintaining “an openness of mystery,” Alice Walker identifies herself as an “earth worshipper” who believes in the intrinsic sacredness of the earth and is interested in the traditional religions of her African and Native American ancestors. In Northern California where she lives, she rigorously pursues and practices the tenets of a highly spiritual life grounded in daily meditation, yoga, and Eastern religious thought. Alice Walker, In Search of Our Mothers’ Gardens: Womanist Prose (New York: Harcourt Brace Jovanovich, 1983); Henry L. Gates and Anthony Appiah, eds., Alice Walker: Critical Perspectives Past and Present (New York: Amistad, 1993); Lovalerie King, “Alice Walker” in Encyclopedia of African American Literature, Ed. Wilfred D. Samuels (New York: Facts on File, 2007).